Welcome to our fire portion of The Backyard Gnome. We cover everything from products like grills, chimineas and firepits, to knowledge and advice to hands-on maintenance and care. Fire is a big part of our backyard experiences, whether we like to sit around a simple firepit with a few friends, roasting marshmallows and watching the embers burn, or we like to light up a chiminea and cook some bread the old-fashioned Spanish way. There is something out there for everyone, no matter the amount of space you have or the kind of backyard fire you want. We’ll provide information on all shapes and sizes of chimineas, open fire pits, barbecues, grills and just about anything else that requires a spark and a little oxygen. Fire was invented 800 000 years ago and since it is such a foundational part of the human experience, we have yet to find someone who dislikes this element. Just about everyone likes to watch a fire. It’s a beautiful escape, watching energy move, change, grow and burn like that. It’s how we cook our food, it entertains us, it keeps us warm and provides ambient light on a dark summer night when all you can see are stars. We review the best barbecues (charcoal, gas or electric), covers, metal and clay chimineas (if you like fire but prefer to keep it contained) as well as how to cook with a chimenea. 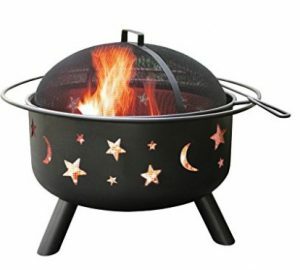 You’ll find fire accessories like outdoor heaters and fire pits. We also cover information on fire safety, how to set up your fire pit for cooking and more. Whatever you need, if you can burn it, we cover it.